Cheltenham Running Club would like to wish runners a Merry Christmas and welcome all runners to invite friends & family to try our friendly club in the New Year Beginners Intake. Beginner’s Week is when we invite new and beginner runners to a range of running andrunning related events free of charge from the 7th to 13th of January. Click here for more information. Would you like to crush your personal best 10k time? Early Bird Registrations are now open for the Cheltenham Running Club 10k Squad. As a 10k Squad member you’ll gain your own personalised running programme which peaks you for multiple events. Gain unlimited guidance from Head Coach, Conor Graham and become inspired and motivated by other squad members in the closed Facebook group. An online course will teach you all you need to prevent injury and make sure your 10 week programme gets results. Click here for more information. Proud to see the recent achievements of Lauryn Ava and her goal to raise money for Macmillan Cancer Support. Help Lauryn change the world! Make a donation now? Learn to run much faster in just 5 days with the Cheltenham Running Club 5-Day Challenge, starting on Monday the 15th of April. Many people struggle to run to their potential on a regular basis... They have plenty of will power but simply cannot maintain the speed they want. It's time to learn how to become a consistently good runner! In this challenge you'll learn how to increase speed gradually through structured training as well as in the final 1k of a race using proven running technique cues increase running speed. You could win great prizes are available including a £100 voucher from Up & Running and much more. A challenge has gone out to businesses across Gloucestershire – to form a team to vie for the title of champion of the inaugural City of Gloucester 10k. Organised by former international athlete turned UK Athletics Ultra distance Coach, Norman Wilson, and his wife Anne, the 10K is open to runners of all abilities. Entries are being encouraged from those looking to embrace healthier and more active lifestyles, and anyone raising money for charity is most welcome. The 10k also aims to attract some elite athletes and club runners – and with the competitive in mind there is also a call for teams from companies to take up the Corporate 10k Business Challenge. The format is all about encouraging some team spirit and a little friendly competition and beneficiaries from the 10k will include the likes of the charity Macmillan Cancer Support. “Ultimately it is all about having some fun – no matter what your level. There is also a 10 km wheelchair race and a two-kilometre family run just before the main event,” said Anne. 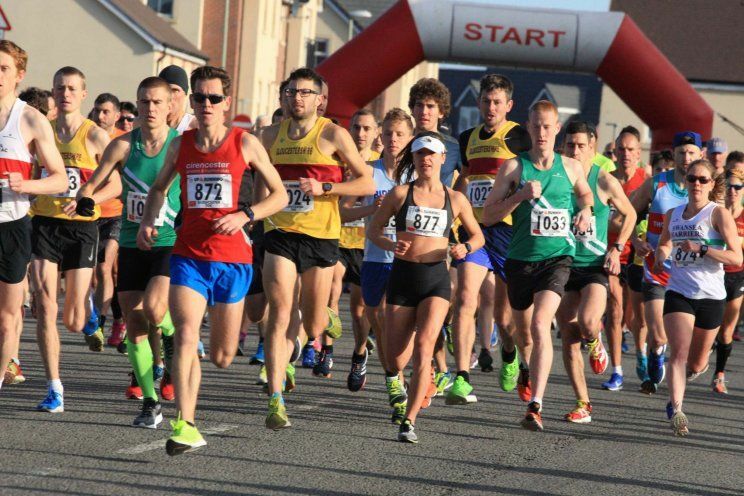 “We hope the latter will be a great day out for all the family – a chance for budding young athletes to race for top spot and for parents and grandparents, aunties and uncles to have some fun as well. “Everyone who finishes the 10K event they will receive a special designed runners medal and a Tech –shirt and in the 2K Children and family Run every runner will receive a finishers medal,” said Norman. In his day Norman as a professional athlete representing Great Britain, he won the Berlin Marathon, and finished in the top 20 at races in Tokyo, New York, Boston, Montreal and Frankfurt. Corporate team entry is £100, plus a small admin fee, but that covers all runners – which then have a chance of lifting the special winner’s trophy, and potentially defending it next year. To attract in runners going for personal best times, and not to scare off anyone just starting their running journey, the course will be flat, fast, scenic and traffic free. Runners will start on Trier Way and finish in Gloucester Park, with the route taking in Gloucester Docks, Castle meads Nature Reserve and stretches of the River Severn and the Gloucester Sharpness Canal. Norman and Anne hope to make The City of Gloucester 10k Run a major road race in the UK Athletics calendar within five years, attracting spectators and national attention to the city, and benefitting the local economy. Enjoy Easter Sunday (whether you run today, or not). Sign up, sign up. Everyone's welcome. Runner's week is for those who run regularly, come and experience Cheltenham Running Club's training sessions. Visit https://t.co/d292ArLa5z for more details.